"You must become the change you wish to see in the world." —Mahatma Gandhi. The NJGA will provide the support and opportunities necessary for children/youth to realize their full potential. "A society needs to allow children /youth the opportunity to develop their minds and bodies in a positive way and I am happy to be involved in this process." "Children are the future! The Academy offers me the opportunity to touch their lives and make a difference. The National Junior Golf Academy is a fulfilling and satisfying endeavour." The National Junior Golf Academy (NJGA) was founded in the Fall of 1999. It is a registered non-profit volunteer driven program, designed to break down economic barriers and to use the rules governing the game of golf to teach youth life-skills. NJGA has been a successful community investment in pro-active subsidized recreation providing these youth with the opportunity to develop social, economic and life-skills. The present strategic focus is the establishment of a self-sustaining and province wide organization that relies on collaborated partnerships with like-minded businesses and organization in local communities. NJGA plays a very important role in shaping the lives of many young residents of Toronto's most needy communities. It provides early identification of youth problems by reaching at-risk youth in a strategic manner, nurturing young dreams to become future leaders and role models. To date, we have positively impacted the lives of over 250 young adults. Our greatest achievement has been to develop a vibrant and vital organization with a genuine community focus in a short period of time. Our next most signal success has been attracting broadly based support in the form of in-kind donations from major golf related businesses. Last, but not least, we have been successful in linking to much higher profile U.S. organizations, thereby attracting a degree of positive publicity disproportionate to our existing size and resources. The primary challenge that we will face in the future relates to building on our successful sponsorships to engage in flexible fund-raising that can be used to establish an organizational infrastructure. The essential key to our future success will be in establishing a central office and securing the servicing of a Director/Fundraiser who can translate potential support in economic sustainability. 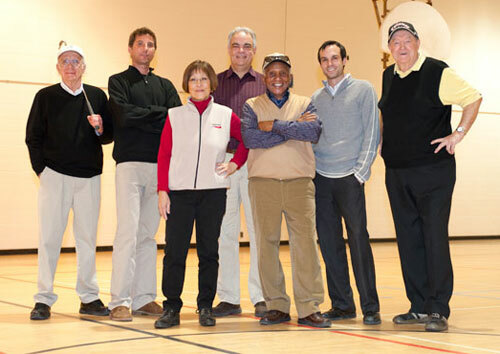 The National Junior Golf Academy is designed: To create avenues by which the children/youth from economically challenged communities of Toronto will have the opportunity to remove themselves from negative environments and allow them access to alternative programming. To provide children/youth with the opportunity to develop economic and life skills. To increase individual self awareness and self esteem through the use of positive peer pressure and role models. To promote healthy active living through enjoyable exercise and to provide skill development through instruction of basic golf principles. To increase anti-drug awareness through participation in activities and programs which promote the anti-drug message and healthy lifestyle alternatives. To send a clear and strong message of zero tolerance for the use of violence and weapons. To promote a team concept through co-operation and team work. To improve and develop important fundamental skills that enable participants to function in the community and to create an awareness of surrounding communities. To teach and enhance life skills that participants can utilize in all aspects of their day to day activities. For example: self-discipline, respect for self and others, safety, problem solving, communication skills, conflict resolution and co-operation. To promote the importance of school and further education. And to educate youth in the rules, etiquette, discipline decorum and fundamental skills of the game. Thank you so much for giving Davidson a good opportunity to go to the golf clinic this Monday. Davidson enjoyed the trip very much. He has learned a lot both in Golf and his future life from this event. He has been inspired greatly by the Dr. Wiren and other professionals. He said he will never give up practicing golf in his life. Also he will put more effort on his study too, It doesn't matter how hard it is and he will never give up. We really appreciate everything you have done for all the kids including Davidson. As parents, we feel very lucky to be able to join your program. Thank you so much.